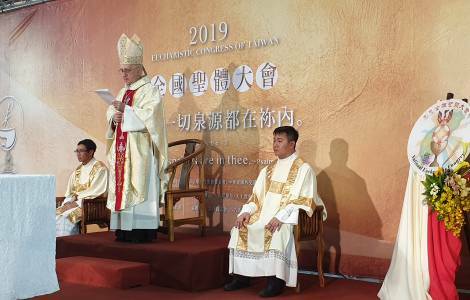 Chiayi (Agenzia Fides) - "May this Eucharistic Congress help the Church in Taiwan to deeply reflect upon her mission and her role in the context of the reality in which she belongs, and to contribute, with her own witness and faithfulness to Christ, to the common good of the People of this Nation". This is what Cardinal Fernando Filoni, Prefect of the Congregation for the Evangelization of Peoples said during the closing celebration of the IV National Eucharistic Congress of Taiwan, which he presided as Special Envoy of the Holy Father, in the early afternoon of today ( local time), Friday, March 1, in Chiay. At the beginning of the homily, the Cardinal brought the greeting and spiritual closeness of Pope Francis, and he focused on the meaning of the two terms: "Eucharistic Congress". "The term ‘congress’ refers to an event of particular importance – he explained -. Today’s event is certainly significant, because it is the coming together of all the baptized. The term ‘eucharistic’ calls to mind the ‘sign’, indicative of Jesus, which he left for his Disciples and the early Church. Through this ‘identifying sign’ Christians would be united to Him and become the family of God in a ‘new covenant’ open to all men and women of all times and places, and founded on the offering of Jesus’ own life to the Father ". Referring therefore to the Gospel of the day, he underlined how the crowds were "fascinated by him and amazed" at his words and his very person. Jesus’ attraction was so strong that, at times, those who listened to him "forgot about their own needs, because his preaching fascinated them". What was it that amazed Jesus’ contemporaries, if not the fact that "he spoke to them of God, not in terms of an idea, a theory, or a dry doctrine, but as one who is like a father or a mother who loves his children… He revealed to us the face of a God who does not abandon his creation to its own destiny, separating himself from it; a God who is not cold and indifferent to human suffering, but who shares in human realities". Therefore Cardinal Filoni continued: "In this Congress, we want Christ to speak also to us. We desire, in particular, that he speak to our lives: to the spouses who do not understand and love each other as they once did; to the mothers and fathers who have serious problems with their children because of addiction to alcohol and drugs; to those who are afflicted with cancer or other serious illness, to those who, because of a lack of work or otherwise, live in a state of serious poverty. Finally, we want Jesus to speak to the elderly and to those who are at the end of their lives, perhaps even losing their purpose for living". A Eucharistic Congress is not "one more event to celebrate", highlighted the Cardinal, but "a great opportunity to rejoice in the presence of Jesus, to encounter Jesus alive in the Eucharist. The Eucharist is the great gift that Jesus himself left for his Church as a memorial of himself, a memorial of that perfect offering eternally made by the Father". Citing therefore the first Letter of St. Paul to the Corinthians, in which the Apostle recounts how Jesus celebrated the Last Supper of his earthly life, he underlined: "In that way, Paul completed his ministry of evangelization. In fact, it would not have been sufficient to bring only the oral message of Jesus, but it was necessary, also, to give the Eucharist to the community in Corinth, without which the work of salvation would not have been complete. It is by means of the missionary work of proclaiming the Gospel and celebrating the Eucharist that the Church acquires strength to give witness to Jesus and to carry out her mission among the people. The Eucharist, the Church’s daily memory of Jesus, brings about grace and missionary commitment". Cardinal Filoni then focused on the importance of missionary work, "so necessary on this Island of Taiwan, where the Church is still small, notwithstanding the many years of evangelization and her many valuable social and educational works", emphasizing that evangelization "cannot be delegated only to a group of missionaries; it must involve everyone: bishops, priests, religious men and women, the lay faithful, families, and even children, who are missionaries to their contemporaries. The work of evangelization, if nourished by the Eucharist, allows the Gospel to bear fruit. In fact, the Eucharist is the very source of the mission of evangelization. Proclaiming Jesus to all is not optional, nor is it a mere consequence in the life of the Church. Rather, it is an essential part of her, because a Church without missionary zeal is sterile". After having recalled the missionary teaching of Pope Francis, the Prefect of the Missionary Dicastery stressed that "the Church desires still today, perhaps more than ever, to respond to the mandate of the Risen Jesus to bring the Gospel to all peoples".